Does your business require a highly reliable PC for its vast operations? Here are the main factors you should look for when choosing and buying a computer for your business. <>A computer is considered as one of the most necessary machines that a business must have. It facilitates basic to advanced operations, external and internal communications, important data management, and much more. With the numerous PC models from various brands that are available in the market today, it becomes more difficult for business owners to choose the best computer that would match their operations. However, there are some that truly stand out based on specifications and features. Asus’ All-in-One PC (AiO) is one the most highly recommended modern computers for modern entrepreneurs. Here are the top reasons why it should be your business PC of choice. ASUS has shipped more than 420 million motherboards since 1989. As an indication of its being trusted and reliable, one in every three PCs sold worldwide in 2010 had an ASUS system board, which is the very foundation of PC quality and reliability. All ASUS Commercial AiO units have passed various extreme quality-control tests---Drop Test, Temperature and Humidity Test, Panel Reliability Test, and Vibration and Noise Test---to ensure consumers that they are buying no less than top quality computers. The brand strives for perfection in all products and it consistently bags awards for quality and innovation. This is reflected in the top ranking previously attained for product quality and customer service from the Wall Street Journal Asia. 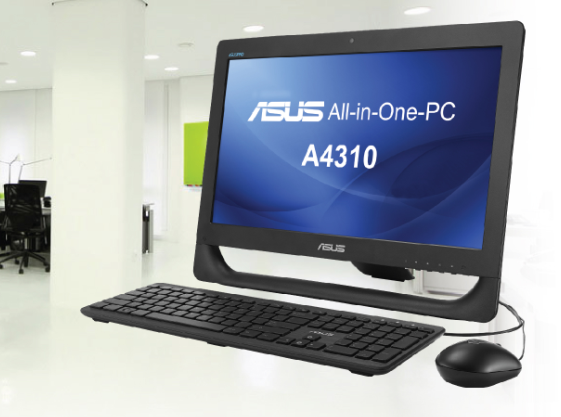 Physically, the Asus’ All-in-One PC A4310’s slim design takes up less space. Consequently, you would have more space left for more productive tasks in your desk. The PC can even be mounted on the wall to further save more on space within your workstation. The All-in-One A4310 comes with the latest generation of Intel® Core™ i5 processors that facilitate easier fulfillment of daily computing, POS, and educational demands. The graphics card (up to the latest NVIDIA GeForce GT820M) in the PC model allows previewing and creation of HD videos more easily and faster, enabling entrepreneurs to share even high-resolution photos and heavy graphics when working. The new Asus AiO A4310 PC model comes with Cloud capability. Entrepreneurs can conveniently share photos, movies, and music utilizing the allotted 100GB of free Cloud space for a year. Sharing files across different devices and PCs can now be done wirelessly and seamlessly. This also means that entrepreneurs can access important and heavy data anytime, wherever they could be. ASUS AiO is equipped with a 2-megapixel camera, making communication with other branches or your business partner abroad easier, clearer, and faster. Connecting the Asus A4310 to any other device would not be a problem. This is because this PC model comes with 6-in-1 Card Reader, VGA ports with HDMI-OUT, and USB 3.0, which facilitates transferring of data 10X faster than USB 2.0, for ultimate speed and ease. Furthermore, it has a Dual In-Line Memory Module door located at the rear to make it easier to upgrade the memory of AiO in just seconds. Thus, its user can instantly add additional memory whenever necessary. The Asus Business Manager is strategically integrated into the system to facilitate automated optimization and maintenance tasks instantly. This integrates ASUS special features including USB Lock, Recovery, Power Manager, and My logo all together. Consequently, access is made fast and easy, enhancing efficiency. In general, Asus All-in-One operates using less energy, making it an ideal machine for SMEs, which strive harder to lower operating costs. This feature could be attributed to its super-bright LED backlit, mercury-free panel complemented by energy efficient Pentium or Celeron (depending on user’s preference) processor. Moreover, the PC’s total package is made of 80% recycled material. Aside from that, the energy efficiency helps protect the environment. The eco-friendly computer comes with Energy Star and Epeat Gold, which are among the highest environmental certifications worldwide today. For product inquires on ASUS Commercial All-in-One and Desktops, please call ASUS Customer Contact Center at (02) 798-5700.